My site contains a few low power transmitters of one type or another, but until now no receiver. This circuit can be used to "sweep" an area or room and will indicate if a surveillance device is operative. The problem in making a suitable detector is to get its sensitivity just right; too much and it will respond to radio broadcasts, too little sensitivity and nothing will be heard. This project has few components, can be made on veroboard and powered from a 9 volt battery for portability. 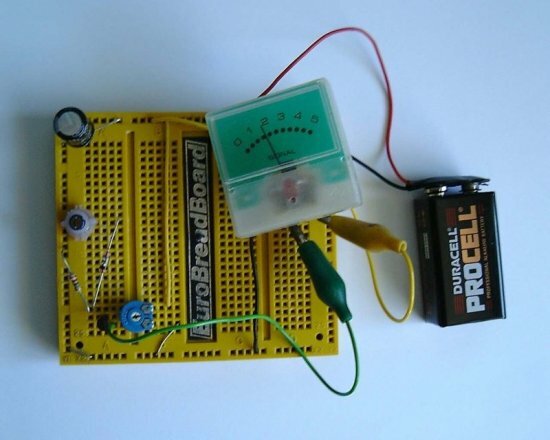 My prototype shown below, worked OK on a Eurobreadboard. Circuit operation is simple. The inductor is a moulded RF coil, value of 0.389uH and is available from Maplin Electronics, order code UF68Y. (See my links page for component suppliers.) The coil has a very high Q factor of about 170 and is untuned or broadband. With a test oscillator this circuit responded to frequencies from 70 MHz to 150 MHz, most of the FM bugs are designed to work in the commercial receiver range of 87 - 108 MHz. The RF signal picked up the coil, and incidentally this unit will respond to AM or FM modulation or just a plain carrier wave, is rectified by the OA91 diode. This small DC voltage is enough to upset the bias of the FET, and give an indication on the meter. The FET may by MPF102 or 2N3819, the meter shown in the picture is again from Maplin Electronics, order code LB80B and has a 250 uA full scale deflection. Meters with an FSD of 50 or 100 uA may be used for higher sensitivity. In use the preset is adjusted for a zero reading on the meter. The detector is then carried around a room, a small battery transmitter will deflect the meter from a few feet away.